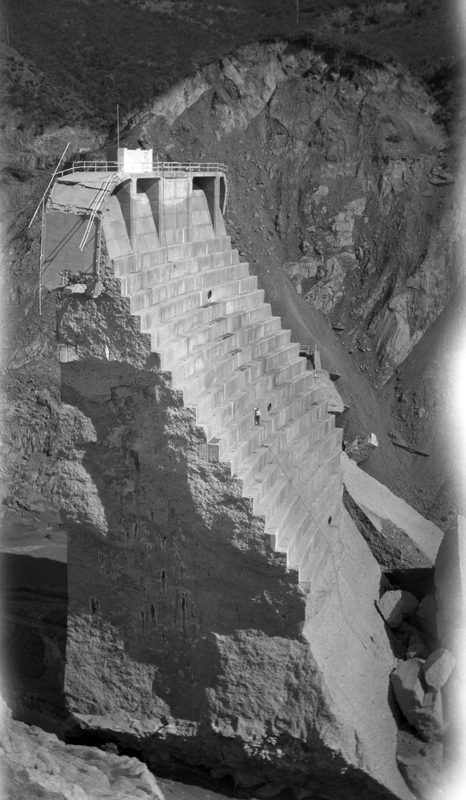 SCVHistory.com DI2816 | St. Francis Dam Disaster | Climbing the Tombstone, 1928. An unidentified person climbs the "tombstone" — the section of the dam that remained standing after the dam broke March 12, 1928. 4x6-inch BW film transparency (larger than 4x5). Date, photographer and original purpose of photograph unknown. To the consternation and embarrassment of Los Angeles water officials, the tombstone became a tourist attraction. In May 1929, fourteen months later, the tombstone was finally dynamited into oblivion after an adventurous young man fell from the top of it to become the dam's final victim. DI2816: 9600 dpi jpeg from original 4x6-inch transparency purchased 2015 by Sharon Divis. Transparency and archival scan on file.